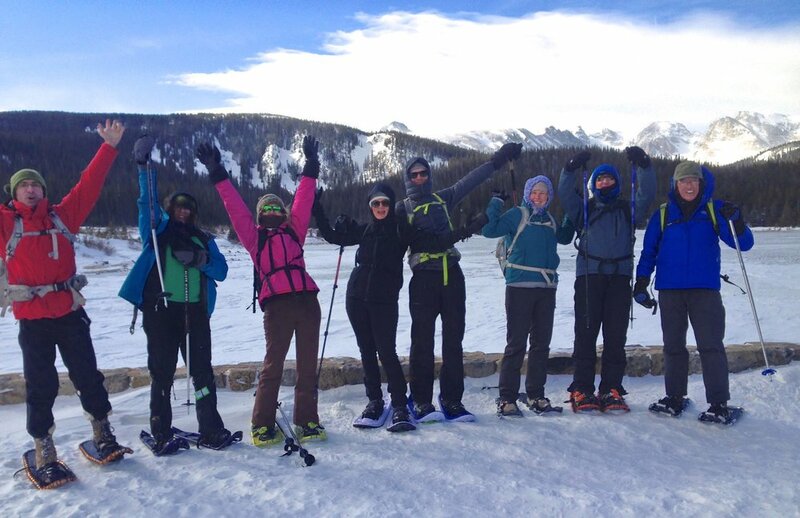 Boulder’s Best Little-Known Snowshoe Trail — FitLiv – Boulder’s Original Fitness Boot Camp & Outdoor Yoga Program. Indian Peaks views right from the Brainard Cabin. Close to Boulder but it feels worlds apart. It always amazes me how few people know about the dedicated snowshoe trail up at Brainard Lake. This is truly one of the Boulder areas special seldom-visited and little-known snowshoe trails. 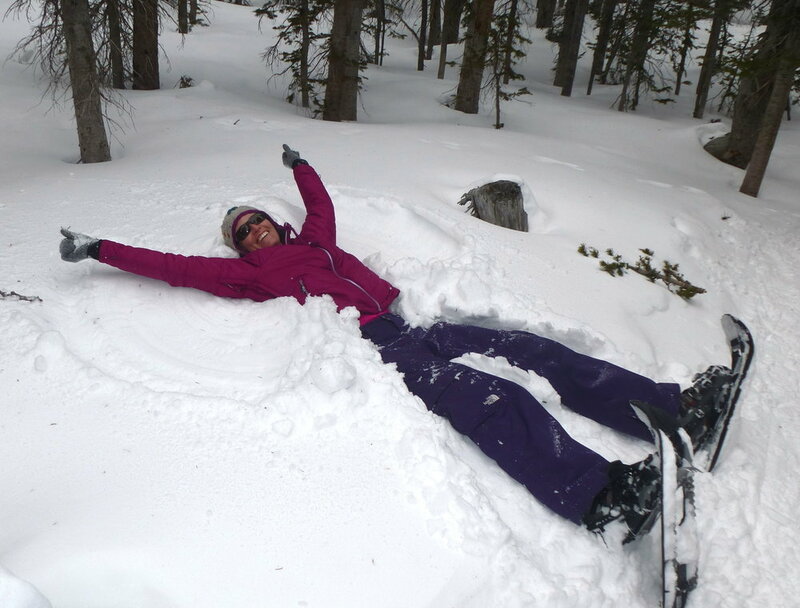 In fact, the Brainard Lake Snowshoe Trail is a dedicated snowshoe trail so you don’t have to worry about skiers zooming down the trail. Not only is the trail quiet and scenic but you are treated to a two-punch reward – first is the view of the glistening Continental Divide peaks from Brainard Lake and second is the cozy & warm Brainard Cabin. The cabin is open to the public and you are encouraged to go inside, sit by the fireplace and enjoy a cup of cocoa or coffee. 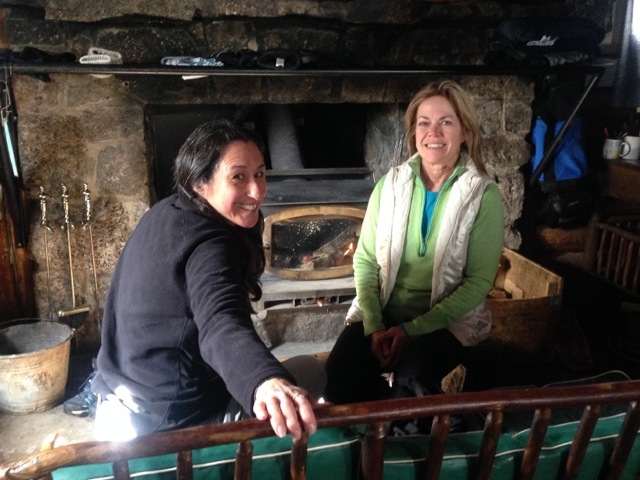 For the last 11 years, FitLiv has led an annual snowshoe adventure to the Brainard Cabin and hands-down everyone loves it. Please note that unfortunately the Brainard Lake Road is closed March 1 - June 2018 for major road improvements. 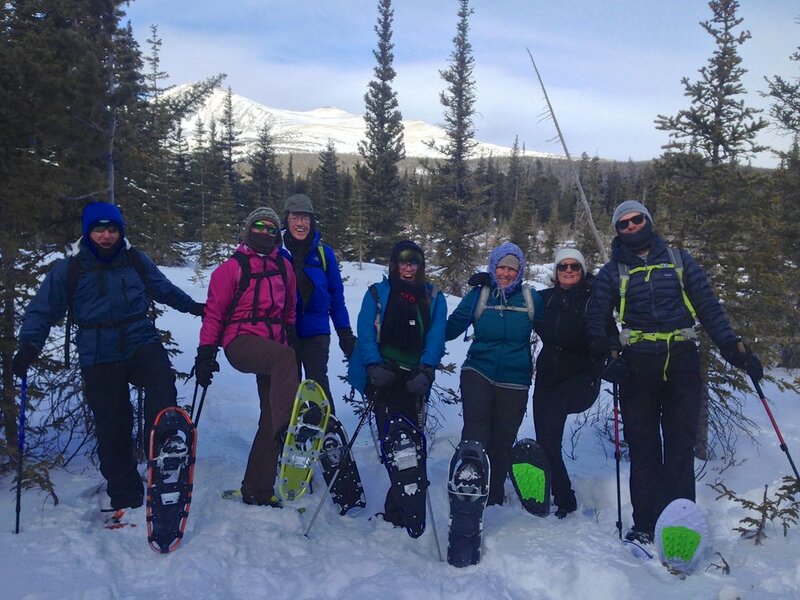 So unfortunately, you will have to wait for the 2018/2019 winter season to enjoy this snowshoe outing. Note that it can be very windy at the Brainard Lake area – but have no fear as almost the entire trail is in nestled in the woods and comfortable even on ‘high wind’ days. The winter parking lot offers outhouses and a nice changing room. From the winter parking lot, return to the Brainard Lake road you entered on and take a right to continue up this road for about 50 yards till you hit the gate across the road. Look to the left and you will see a few trail signs – the marked snowshoe trail heads up and into the trees. This description will help you navigate but know that this is a very well-marked area and is one of the easier trails to follow. The trail stays south of Red Rock Lake and continues on the south side of the Brainard road for about two miles. The trail then turns north [right] and joins the road. This isn’t marked that well here but turn left on the road and look for another trail sign on the right side of the road after about one hundred feet. Take this trail, and remain north of the Brainard road all the way to Brainard Lake. You will walk through the summer campground and at times it may be hard to know which of the packed down trails is the official trail but just know that all the trails continuing west will lead to the shores of Brainard Lake. The views from the east end of Brainard Lake are stunning but it can be really windy. Once you have identified the snowy Indian Peaks proceed north [right] on the road to cross the concrete bridge over Mitchell Creek. After the bridge look north, and in about 20 yards you’ll see another trail sign that will lead you north back into the woods. In just a few minutes you will see another trail sign – take the left trail split continue on the snowshoe trail. The trail climbs uphill and after 15-20 minutes you will reach a signed junction. Take the left trail to Brainard Cabin, only 200 yards below. The Colorado Mountain Club (CMC) cabin was built in 1928. Most winter weekends there is a host that opens the cabin to visitors. To ensure that the cabin will be staffed and open, please check the CMC cabin host schedule below. The club asks that you sign their visitor’s log and donate $1. Help yourself to their complimentary tea, coffee or cocoa and pull up a chair by the wood fireplace. $24/day for members [$32 non-members] - by reservation. If you do adventure out to the Brainard Cabin, do share a comment with us to let us know if you agree that this is Boulder’s Best Seldom-Used Snowshoe trails. FitLiv is Boulder County’s original Boot Camp company. For the past fifteen years, Boulder-based FitLiv has been dedicated to motivating, educating, and encouraging adults to get active and fit. The company’s four-week fitness Boot Camps and PowerFit Yoga Camps run year round, indoors and out, and are available in co-ed or women’s-specific sessions.